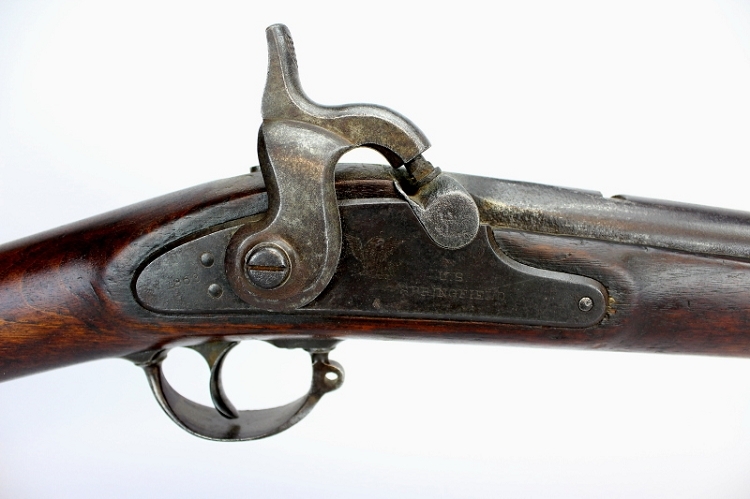 This original M1863 is in good condition; and with a little work, could be made into a good shooter. The stock is full length with no cracks of major chips. There is also no burnout behind the hammer. Original inspector's cartouches can still be found on the left side lock panel; indicating that the stock hasn't been sanded or refinished. The lock, as well as the rest of the steel components, has a dark an even patina but the stamps are crisp and legible. The barrel is full length and the rear sight is missing. The bore is smooth but could easily be relined. The furniture is all original including the ramrod; which is full length.